The free event will run from Friday 26th to Sunday 28th April at Tate Modern, in the Tate Exchange area on the Fifth floor of their new Blavatnik building. You are welcome to come along any time between 12:00 and 17:00. You can let us know you’re planning to attend via Eventbrite: www.age-allies-continuum.eventbrite.co.uk. The three-day programme – titled ‘Age/ncy’ – will see a whole host of organisations set up installations, performances, and workshops to explore and celebrate the ageing experience. 'Age/ncy’ offers an interactive space for us to reflect on perceptions of ageing and celebrate the profound sense of identity, community and independence that older people can access through art. This unique event will feature a diverse programme of activities, from musical performances and physical theatre right through to parkour, stand-up comedy and even circus skills! So, drop-in and explore the idea of ageing as transition and examine the changes in identity that we all experience, whether young or old, as we travel across the life course! ‘Age/ncy’ has been organised by Flourishing Lives, a coalition of arts, health and wellbeing organisations taking a creative and aspirational approach to supporting richer, more independent lives for people over the age of 55. As a result, the ‘Age/ncy’ installation will include artists, community groups and organisations from across the Flourishing Lives coalition. Age UK London has been offered a space at the Age/ncy workshop as part of our Age Allies programme, an ageism awareness project funded by the City Bridge Trust. Our Programme Officer Richard Norman has worked with his select group of Age Allies volunteers to create a workshop designed to help visitors reflect on their experience at the ‘Age/ncy’ display and to discuss how their views on ageing have changed as a result. 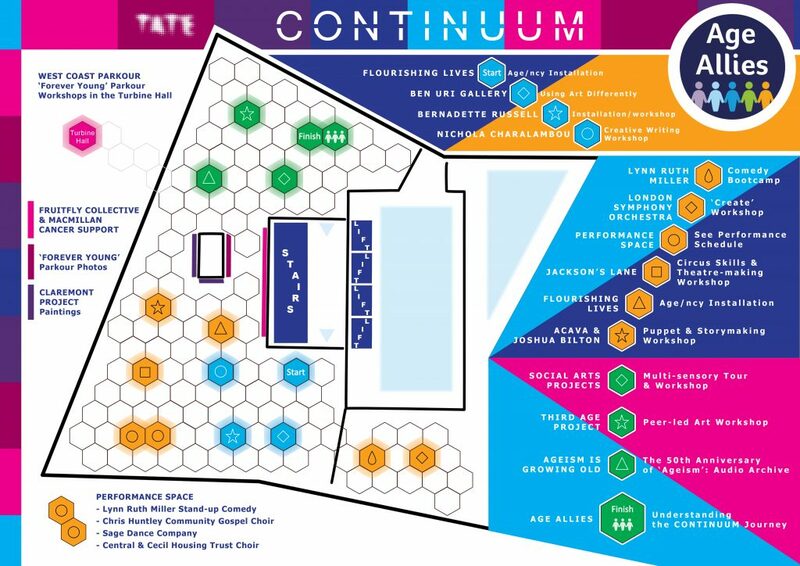 Visitors to the ‘Age/ncy’ installation will be guided by our specially-designed map, titled “Continuum”. Continuum has been designed as an interactive ‘board game’ to help you move through the Age/ncy space. The hexagonal ‘game board’ tiles allow you to move across the room, inviting you to connect and participate in the activities while reflecting on your own experience of ageing. How you choose to sojourn through the space will be as individual as you are. It is a journey of self-discovery, offering you greater awareness of your assumptions and your potential. Past, Present, Future - Take a moment to think about your own journey through life. Close Encounters - An opportunity to meet with our Age Allies volunteers to ask all your burning questions about ageing! Continuum Reflections - The final part of the journey: your chance to reflect on Age/ncy as a whole. We want to hear how your journey through the Age/ncy workshop has changed the way you think about age, and to further explore your assumptions and understanding of ageing. So come along to ‘Age/ncy’ at TATE modern on 26th-28th April and challenge everything you thought you knew about age! You can let us know you’re planning to attend via Eventbrite by clicking here.